Sit yourself down, you’re in for a long ride! Welcome to the two-part theatrical event known as Sojourners and Her Portmanteau. Written by Mfoniso Udofia, two chapters of her nine play epic series is on display at New York Theatre Workshop. Thankfully, the plays are in capable hands. If you are familiar with his work, then this show should come of no surprise. Ed Sylvanus Iskandar is back to directing an epic play series. But even with two proven powerhouses teaming up for a repertory evening of storytelling, Sojourners and Her Portmanteau is lacking. In the two stories’ chronological order, Sojourners follows a young woman named Abasiama as she struggles with the life of an arranged marriage, finishing her studies, and a husband captivated by American culture more than her and her pregnancy. Determined to go back to Nigeria, Abasiama battles her dreams and responsibilities in an unknown world. In Her Portmanteau, Abasiama’s decisions are brought to the present as she and her daughters are forced to confront tradition and culture through the lens of family. To begin, I attended Her Portmanteau first and Sojourners second. And it’s quite interesting to watch the second part first. With little knowledge of the events that lead into Her Portmanteau, you’re able to play detective and then watch those events unravel. 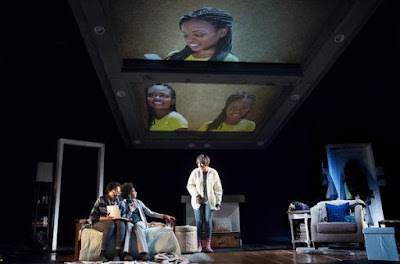 In Her Portmanteau, Udofia writes a strong relationship play about mother, daughter, and estranged daughter who all are brought together in a tiny Inwood apartment to discover the bonds of family and their personal ideals of the future. Udofia focuses on the relationships, both close and distant. By the end of the piece, you truly are able to understand the characters and circumstance having little information from the previous play. Abasiama is a link between her two daughters but the sparks between Iniabasi and Adiagha are truly the dynamic of the play. All three of the characters have intentions from one another that they expect to be honored, yet they seldomly reveal their desires. This cause of conflict truly steers the action in this piece. In a play about forgiveness and loyalty through the lens of what they believe the world to be, Udofia provides a modern interpretation of family that is nothing short of captivating. Her Portmanteau is simple and that is enough. Sojourners is anything but simple. It’s slower moving and focuses on language much more than relationships. Jumping 36 years in the past, Sojourners is a period piece about a pair of students who emigrated to America for an opportunity to learn. Abasiama knows it is best to go back home after receiving her degree, but with a child looming and attention from a man who truly cares about her, the life she wanted is not the one she ends up with, as she sends the child and her father back to Nigeria. Udofia forces a bit more unnatural exposition into this play. There is a lot to learn through the various culture shocks experienced by the characters, which causes some of the slow-moving action. But once the lines are drawn, the conflicts arise, and the new relationships solidified, Udofia keeps you glued to the edge of your seat as Abasiama must make life altering decisions. As a whole, Her Portmanteau is the stronger of the two plays. It has the power to stand on its own. While Sojourners is a story by itself, it’s best as a pair. Iskander is strongest when his direction is simple through epic proportions. For him, epic battles between characters works in his favor as opposed to behemoth of a set. A turntable typically helps keep a show moving and yet the simplicity of Jason Sherwood’s piece worked against him. The moving parts stalled the action in Sojourners. Iskander’s staging came across as clunky, with his actors forced to park and bark at center stage due to the mechanics of the set. With the limitations of a single set in Her Portmanteau, Sherwood compiled beautiful pieces to make up Adiagha’s clean apartment. The giant projection structure used in both pieces was beneficial to see a plethora of images, whether it be walking shadows or family photos, that added to the mood of the story. Costume designer Loren Shaw did a tremendous job playing with time and culture in the design of the two plays. The garments felt honest and true for the characters. Even if some of the pieces felt as if they came from a bag from a costume store in Sojourners, it reflected the feeling of the characters attempting to fit into America. If you are someone who doesn’t read their program, you might not have known about the exceptional performance coming from Chinasa Ogbuagu. In part one, Ogbuagu took on the two play’s central character, Abasiama and in part two she played American-born daughter Adiagha. They were such a transformative performance, you might have believed it was two different people. As Abasiama, Ogbuagu played into the reserved nature of a woman who was fearful yet excitable about the future. There was a spark in her eye each time she would cross paths with her new companions. As Adiagha, Ogbuagu was gentle on the verge of explosion. Playing mother and daughter, you can see how the former influenced the latter. Ogbuagu gave a true acting masterclass. The remainder of the company gave exceptional performances, with a few standing out above the rest. Lakisha Michelle May is a ball of energy as Moxie the prostitute. 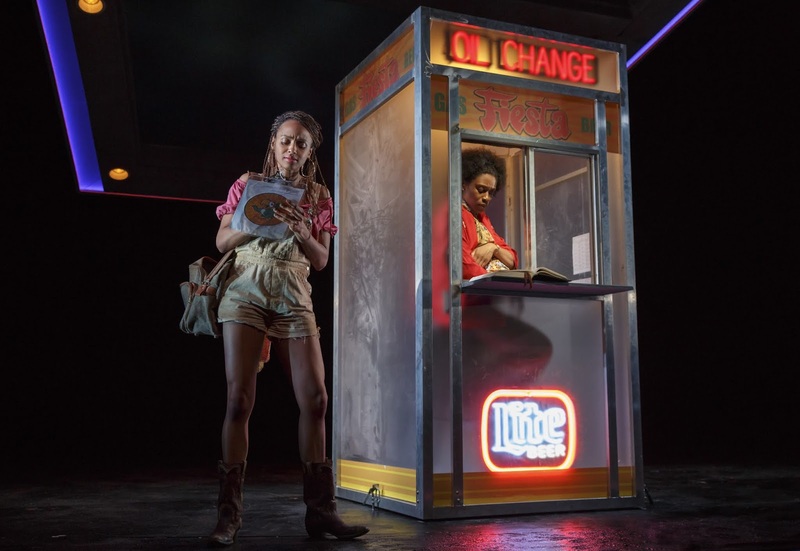 The differences between Moxie and Abasiama brought out the buddy nature of the two, but May’s quick wit and characterization made her a genuine scene stealer. Chinaza Uche comes to life as the amiable Disciple. It’s no wonder Abasiama would pick him over her first husband. Mfoniso Udofia has written two bountiful epic dramas that have brought a new perspective on family. And yet there is still some disconnect. Sojourners and Her Portmanteau desired a bit more cohesion beyond its characters.